Who doesn’t want to sell more handmade products? Of course that’s what every handmade business owner is after. But there’s a common misconception when it comes to sales. People love my work, but they’re not buying! I’ve said the words myself. The problem is; you can’t go by what people say, you have to go by what people buy. It’s easy for someone to say “that’s really nice”. We all do it and probably say or think it a hundred times when we’re shopping at a craft show or the mall. But when it comes time to literally put our money where our mouth is, although an item may be “nice”, we may not be willing to let go of our hard earned cash for it. There’s an unlimited source of nice things in this world that we could spend our money on but we all have limited funds. Compliments don’t pay the bills so let’s find out why people are saying they love your work but not actually buying it. Here’s how you can sell more handmade products. WHICH LOW HANDMADE SALES SCENARIO ARE YOU? There are a couple situations in which business owners who want to sell more handmade products are wondering why they don’t have sales or why their sales numbers aren’t as high as they’d like them to be. YOU HAVE SHOPPERS – traffic is coming to your website, your products are being liked/favorited and shoppers are stopping by your craft show booth. But at the end of the day, the sales just aren’t there or you’d like to sell more handmade. 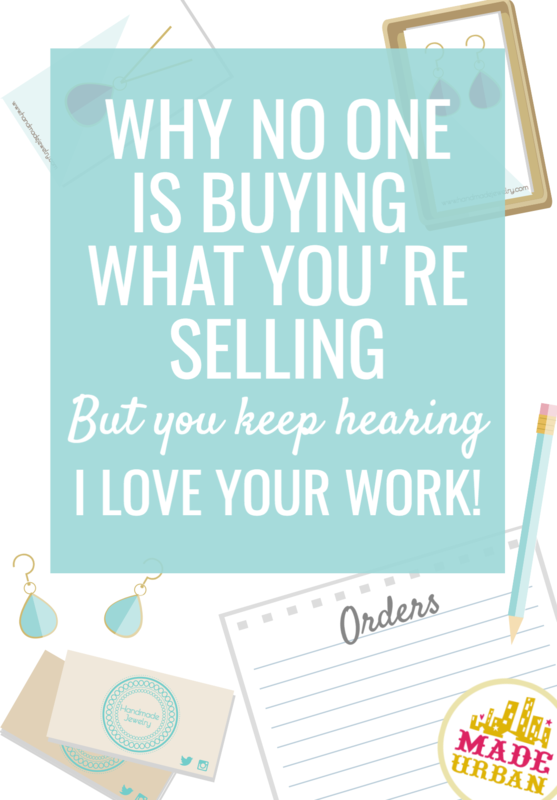 If this sounds like your craft business’ situation, below you’ll find a few reasons people may be looking at your handmade products but not buying. YOU AIN’T GOT NO SHOPPERS – you’re posting your crafts on social media, joining every online handmade marketplace, selling at craft shows, etc. but shoppers aren’t noticing them. There are no likes, no traffic and no browsers in your booth. If this sounds like your craft business’ situation, you most likely need to work on your marketing. First, head over to this article to see if you’re making these common marketing mistakes. Once your marketing is up to par, you’ll start seeing shoppers come in. If they buy, great, you don’t need this article 😉 If you have the shoppers but still no paying customers, come back to this article. In this article, were going to assume you’re getting your handmade products in front of people but they’re just not buying or some are but you’d like to sell more. Attracting shoppers and getting your handmade products viewed is a different ballgame than actually selling them. How much traffic are you bringing to your products? It may be that your sales are on average for your traffic and you’re just not attracting enough shoppers. 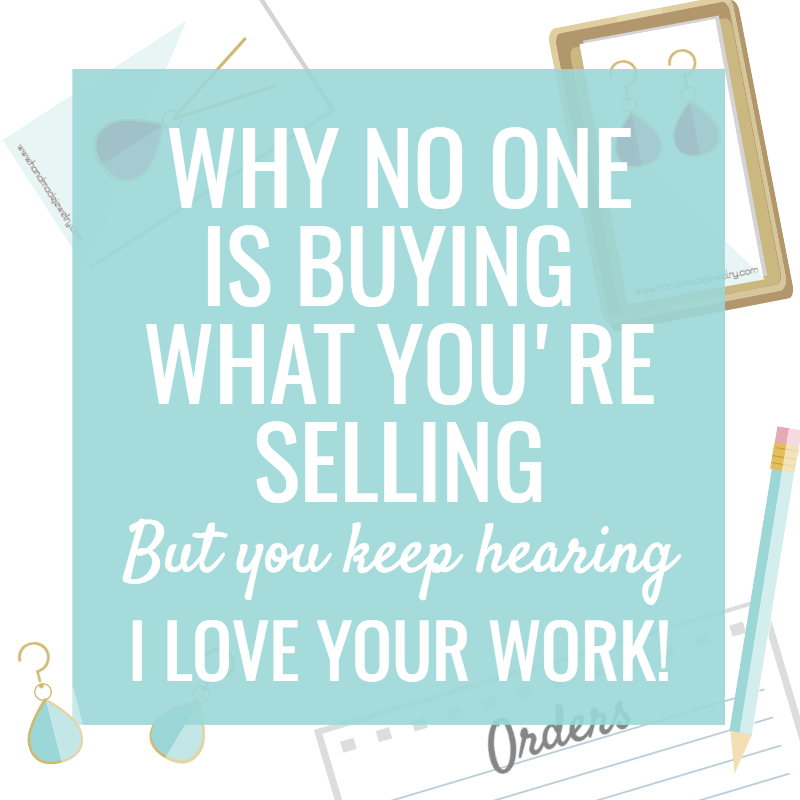 Unless you’re the best sales person in the world, every person who visits your craft business’ website, online shop or craft show booth, will not buy. The average conversion rate is 1 – 2%. That’s it! That means that if 100 people visit your craft show booth and you sell your handmade products to 1 or 2 of them, you’re doing pretty good conversion wise. Puts things in perspective doesn’t it? Although you may have thought you had lots of traffic, views, likes, etc. this week and should have a sale by now, your sales numbers may actually be on par with the average conversion rate. Perhaps you just need to attract more shoppers in order to sell more handmade products. So before you jump in assuming you’ve got more than enough people visiting your craft business’ online store or looking at your handmade products, do some calculations. What’s 1% of your website’s traffic for the week? If it’s less than the amount of sales you want, you need to work on your marketing and drive more shoppers to your handmade products. Start with this article. If 1 – 2% of your online shop or craft show traffic is higher than the sales you actually made, see if the reasons below may apply to your handmade business when it comes to low sales. So let’s get down to how to sell more handmade products. At this point I’ll assume you’re doing a good job marketing and shoppers are viewing your products. If you’re hearing “I love your work!” but have no sales, is it possible people are being kind? Let’s get the harsh, hard to swallow possibility out of the way first. There’s no shame here, we’ve all been there. I’ve had to take a hard look at all the businesses I’ve started and be really critical. There has not been one product or service I’ve offered in my 15+ years of being an entrepreneur that didn’t require me swallowing my pride, going back to the drawing board and changing what I thought I got right. Of course my first reaction when questioning if I might actually have a bad product or service was to get defensive. No way! So many people have said what a great idea it is and that they’d totally buy one. There must be another reason I’m not selling more. But if at the end of the day, no one is buying; how good could my product/service really be? Then I thought about it. If a friend, family member or even a stranger was telling me about their business and how excited they were to start it, would I tell them it was a good idea, even if I didn’t fully believe in it? Yes, yes I would. Not to lie to them but I just wouldn’t want to rain on their parade. So if I could lie to someone about thinking their idea or product was great, isn’t it possible others have done it to me? Absolutely. I had to decide; did I want to be right in my own mind or did I want to sell more? Once I accepted that my business might not be as amazing as I thought it was, I was able to look at it with a critical eye and make the necessary changes. You’ve come to the realization that maybe people don’t like your product as much as they say they do. Don’t get discouraged. This is all a part of running a handmade business (or any business for that matter) and I actually think this is the fun part. You get to go back to the drawing board and be creative. You can brainstorm new ideas, test new handmade products and shake things up a little. But you’ll need to be strategic if you’re going to make changes to your handmade products. Don’t guess what needs to change and which features might make your products better. Do your research. Follow the steps in this article to determine how you might make changes and if they’ll help you sell more handmade. You should also download the free sample chapter from my ebook MAKE MORE MONEY AT CRAFT FAIRS. Even if you never plan to sell at a craft show, the advice in the sample chapter is all about your products and a must read for any handmade business owner. Trust me, it’s a gooder. If you truly do believe that people love your work but they’re just not buying, it could be your prices. I would never suggest a handmade business owner randomly drop their product’s prices…you know me better than that by now 😉 And I’m not suggesting you cut corners, undervalue your work or set prices based on your competitors’, just to sell more handmade product. In most cases, handmade vendors under price their work. But if you’re starting out and using the pricing formula: materials + time = cost, cost x 2 = wholesale price, wholesale price x 2 = retail price (or something similar), it may just be that your material and time costs are too high, bumping the rest of your totals up. You can’t stay stuck in the mentality of: well that’s how long it takes me to make an item and I can’t lower the price or I’d make no money. If the amount of time you put into a handmade product is pushing the price higher than people are willing to pay, you don’t have a sustainable business. Let’s say you’re shopping for a basic white t-shirt. If you found two very similar styles and quality of shirts at two stores, one selling it for $30 and the other for $25, which store would you purchase from? Shoppers never want to pay more than they need to. So if they can buy a similar handmade product, of similar quality and pay less, they will. It’s not about getting into a pricing war with your competitors; it’s about showing the shoppers who come to you, why your handmade products are worth the price and giving them more reasons to buy from you than not to. But shoppers will pay more for a brand. Let’s say the $30 t-shirt is in your favorite store. You love shopping there. The people are so friendly, the smells, sights and sounds are always amazing, the vibe is cool and you love carrying around their branded shopping bag and unwrapping your purchase once you get home. The $25 shirt is in a store you’re not as familiar with. You don’t get a great feeling when you walk in the store, there’s not much attention to detail and you have a hard time finding any help. In this case, you may not even bother checking out the store with the $25 shirt. You may know you can find a similar product at another store but you love the experience you get from the store with the $30 one, you don’t mind paying the extra $5 for the experience, convenience and their known quality. If you want to sell more handmade product and you believe your prices may be hindering your sales, you can either find a way to lower your material and time costs or you can leave your products and prices as is and work on your brand. There’s also the other side of the spectrum; you may be pricing your handmade products too low. If shoppers think your prices are lower than they should be, you could be sending the wrong message. Shoppers may think the quality is going to be poor or that something is off. People don’t want to overpay for their handmade products but they also won’t buy if they think they’ll be getting a lower quality item. The handmade vendor also loses a bit of their authenticity. When you come across a pair of earrings priced at $5 and another pair priced at $30, you automatically think the vendor selling the $30 earrings has more experience and knowledge in jewelry making. They seem more authentic and confident enough to charge that price because they know the value of their work. It’s easy to think the price is so low, why wouldn’t someone buy? Everyone can afford this price. But that’s not always the case. Let’s go back to shopping for that basic white t-shirt. This time, imagine shopping online, when you can’t examine the product. Again, you come across two stores. The shirts look identical but one is priced at $5 and one at $30. Do you think you’ll be getting the same quality t-shirt if you go with the $5 one over the $30? I’d assume the material is thinner, it likely won’t wear or wash as nice and I won’t get through a year before it starts to wear out. $5 may be great if you’re looking for something cheap to throw on under sweaters. But if you’re looking for a classic white tee you can wear for years to come, feel good when you put it on and get a great fit, you’ll probably go with the $30 t-shirt. Which scenario do you think a shopper is going for when they’re buying handmade? Something they can use a couple times and not show off? Or something they’ll be proud to wear and feel amazing in? If your work is priced higher than average for a reason, it’s your job to point that reason out and help shoppers understand your prices. If you want to sell more, you also must be sure every aspect of your business says your handmade products are worth their price; this is where your brand comes in. If you feel your sales would benefit from lowering the prices of your handmade products, you must first lower your costs. Otherwise you’re eating into your profits and you have to sell more to make the same amount of money. This article covers what to do when your prices are too high. If you believe your handmade products are priced too low, simply start raising your prices. Many handmade vendors are skeptical about making an increase in price and believe it may harm their sales. But if you’re currently unhappy with how much handmade product you sell, what’s the harm in bumping the price up and seeing where it gets you? Many handmade business owners have reported they sell more handmade product when they raise their prices. Again, be sure the elements that surround your handmade products support your price point. If your photos, descriptions, packaging, etc. are lackluster, the higher price point may not help communicate higher value and you still won’t sell more. If you need help increasing the perceived value of your handmade products at a craft show and creating a display that supports your prices, join the FREE CHALLENGE – 5 DAYS TO A STANDOUT DISPLAY. Thousands of handmade vendors join each month and email to tell me how much they enjoyed it and all the ideas it sparked. I think you’ll love it too. Check out more on it here or sign up for free below. I know, you likely don’t enjoy selling but if you want to sell more handmade, it’s necessary. You definitely can get away with less selling at a craft show if every other aspect of your display is on point, but even then, you need to give the shopper a little something. When it comes to selling online, the same applies. Your description is your sales pitch and all other elements (your product title, photos, bio, policies, etc.) need to play a supporting role and tell shoppers you can trust me, you’ll be making a good decision if buy from me. Not many products sell themselves and most shoppers need help, in one way or another, to envision a product in their lives and move from shopper to customer. When’s the last time you saw something and bought it without a second thought? There was no display, no photos of the item on the model, no sales pitch and no signage pointing out the benefits. Most of the time, there are hints from the seller, telling you: you need this product. It may be a mannequin in the front window helping you imagine the entire outfit (not just showing the top or an accessory on its own). Maybe the sales person told you: That face cream is our top seller. I use it every day and have noticed a big change in my skin’s texture. Or it could have been the packaging that pointed out the 100% organic ingredients used. If you simply set your handmade products on the table or post a photo online, without much information aside from the price and what the item is, you’re leaving it up to the shopper to talk themselves into needing your product. Which doesn’t happen often unless they’re already familiar with the product or the brand. There are times when you rummage through products and decide to buy without the persuasion of the seller. But generally it takes you longer to get to the “sold” point and it’s you selling yourself on the idea of owning it. You pick up an item, examine it, tilt your head and try to imagine how you might wear it, where you might place it in your home or if you’d enjoy using it. Your shoppers may also sell themselves on your handmade products without any persuasion from you. However, they’ll likely need more time to think about it before purchasing, during which, another vendor may sell them on their products. They also don’t have all the information needed to make a decision. How do they know the gem used in the ring is vintage and from Europe? Or that the yarn used to knit your hats can be washed and won’t lose its color or shape? And how might a shopper know the benefits of charcoal soap if they’re unfamiliar and you don’t tell them? If you want to sell more handmade, don’t assume your shoppers know everything you know about your products or the materials/ingredients/techniques you use. they walk away but come back later to buy – they had to convince themselves, your pitch didn’t quite do it. your description is one sentence. Selling doesn’t have to be complicated or hard. You just need to put yourself in the buyer’s shoes. What do they care about when shopping for handmade products like yours? Which features are they looking for? What are their concerns? First, switch from the mindset of a maker to one of a shopper. We’re often so close to our work, we talk to shoppers as though they’re our colleagues, with the same knowledge of products, materials, techniques, terms etc. as us. For example, someone who sells soap may label their bars as “cold-processed”. Other soap vendors may know what that means and the benefits of cold-process soap. But I personally have no idea…..and I buy a lot of handmade soap. If you’re finding it difficult to step out of your shoes and into your shopper’s, try this exercise. Think about something you want to buy. It makes it easier if it’s similar to the product you make and sell. The item should be something you actually want or need and aren’t able to make yourself. It could be an item you’d purchase from another handmade vendor or something that’s mass-produced and you’d go to a large chain retailer for. For example, if you knit hats, perhaps you want a felt fedora. If you make beaded bracelets, maybe silversmithing is outside your realm of skills and you’re looking for a metal cuff. Or if you make soap, you might be in the market for a high-end eye serum. Once you have that item you want in mind, answer the questions below. Think about them only from the perspective of a shopper, take your products completely out of the equation. Write your answers down so you’re able to reference and apply them in the next step. Why do you want the item? What problem is it solving or desire is it fulfilling? To look cool, on trend, to wear with a certain outfit, to make you feel more confident, etc. How do you imagine wearing/display/using the product? How would you wear it? Where would you display it in your home, with what type of décor? How do you want to look or feel when using the product? How will you know when you’ve found the right one? What type of image or description would make you say, this is it! What would make you hesitate? What might run through your head before a purchase? Hmmm, I don’t know…the fedora looks great on the model but I’m not sure if it’ll look good on me. Or: That metal cuff looks like it might be heavy and uncomfortable to wear. Or maybe: This cream sounds too good to be true, I don’t know if it will actually get rid of my wrinkles. Once you have honest answers to the questions, you can think about your shopper and the similar thoughts they may have when it comes to shopping for your handmade products. You may discover that you’ve been busy pointing out the types of beads used in your bracelets when really, if you were the shopper, you wouldn’t be concerned whether a bead is Lucite or resin. You might be wondering if the bracelet will help you create the latest “arm party” trend and what other types of bracelets you could layer it with. Here’s how you might answer and apply these 3 steps. Why do you want the item? You want the hat to look cool and on trend at the music festival. How do you imagine wearing/display/using the product? You can imagine yourself wearing the hat with wavy hair, aviator sunglasses, a vintage tee, jean shorts and a leather wrap choker. How will you know when you’ve found the right one? If you come across an image that shows a model wearing the hat, similar to how you imagine wearing it and maybe even the setting you’d wear it in, you’d feel confident it’s the right product. You want to see that it’s going to fit the way you want it to and look good with wavy hair. What would make you hesitate? You may question if the product will fit your head, if it will look as good on you as the model and what type of quality it is. Why does your shopper you want the item? They may look for a new knit hat when they see a celebrity wearing a new trend. This information will not only help you decide which photos to include and how to describe your handmade products, it will also help with product design. You may keep an eye on celebrity knit hat trends for each season and base the colors, styles and types of knit on those. How might they imagine wearing/display/using your product? The shopper may imagine wearing the hat in a similar way the celebrity wore it. If the paparazzi caught the celebrity on an early morning coffee run to Starbucks, with the hat covering up their bed head, they may think of a knit hat as a great accessory when they’re feeling a little lazy or want to look pulled together and trendy with little effort. How might they know when they’ve found the right one? If they come across a photo or description painting a similar picture to the one they imagine wearing the hat in, they’d likely be sold. You may recreate the look and setting the celebrity was photographed in to help your shoppers imagine how they might wear your hats and where they might wear them to. Taking photos that help you sell more of your handmade products takes effort (take it from this Instagram expert who showcases thousands of handmade products on her account with over 100,000 followers. She shares her best tips here). Photography improvement is one of the areas most handmade vendors skimp on and could benefit from. Laying the knit hat flat on the ground doesn’t show how the hat fits, how it looks with hair, how much it covers the ears, how much slouch it has, etc. Placing the hat on a Styrofoam head or taking a selfie of you wearing it with your kitchen sink in the background helps show how the hat fits, but your shopper doesn’t identify with a Styrofoam head or want to imagine themselves wearing the trendy hat around home. They need to believe that your hat is going to make them feel stylish. Creating a picture of how and where your ideal client will wear the hat, drastically increases your chances of making a sale. Plan photography sessions in advanced. Making an item, photographing it and posting it online doesn’t allow you to put your best efforts forward. Plan your product collections, build stock, photograph all pieces then update your online store. Then you can be more efficient and organize a model, location, hair, makeup, etc. and photograph your entire new fall line in a couple hours. Rather than doing a last-minute, half-baked photoshoot after you finish an item and relying on artificial lighting, your living room and yourself to be the photographer and model. What might make them hesitate? your shopper may also worry that the hat might not be the right fit on them. This can be remedied by including the dimensions of the hat and instructions for the shopper to measure their head. You could also comment in your description how the hat looks great on everyone; cute with short hair, long curls or with a side braid. Or even include a guide for which types of hats work well with different types of face shapes and hairstyles. They might also wonder if the hat will stretch, pill or fade. You can point out that you know how frustrating it is when a hat stretches out and slowly inches down your forehead as you walk. Then describe the quality of the yarn and the type of knit you use around the band to ensure this problem won’t occur. Once you’ve determined how your ideal customer shops, what they’re looking for, what will make them fall in love, what they’re concerned about, etc. you’ll have an easier time drafting up your sales pitches. When selling at a craft show, you’ll use your sales pitch in conversations with shoppers. There’s a fine balance of getting out what they need and want to hear without taking up too much of their time. There’s a simple 5-step formula you can follow to draft up your sales pitch in my ebook MAKE MORE MONEY AT CRAFT FAIRS. An entire chapter is dedicated to selling. Including ways to naturally start a conversation with your shoppers and how to become truly comfortable standing behind that craft show table and actually selling to people…not just answering questions or pointing out the obvious. Once you know what you’ll say to sell to people at a craft show, you can easily apply a similar pitch to the description of your handmade product listings. You can check out the ebook here. When selling online, you’re not able to read your shoppers and adjust as needed so be sure every aspect of your online store is sending the right message. From your product’s title, description and images to your store’s bio, navigation and stock, there are a lot of pieces to consider. There’s more information on selling in my other ebook THE SUCCESSFUL INTROVERT which focuses more on online selling and how to get away with as little amount of speaking and in-person selling as possible. Have another theory as to why people say they love an item but don’t buy? Share in the comment section below! I sell my ‘sort of over the top’ jewelry at art shows. I often have people tell me they love a piece but don’t go anywhere they can wear it. I enthusiastically tell them how I wear my pieces to the post office, the grocery store, the airport, etc. and how often, as a result, I have the most interesting conversations with people who notice the piece. Sometimes, if someone seems hesitant, I will admit my pieces are not for shy people who don’t want to be noticed. This usually invokes a laugh and can also make them see themselves as confident to wear it. If they remain unsure, I will show them something a little more sedate but they will, quite often, go back to the original one. Hi Cassandra! Thanks for reading and commenting 🙂 That sounds like a great sales technique. It may even help to photograph some of your “over the top” pieces being worn with casual outfits in casual settings (jeans and tee at a coffee shop?) to help shoppers see how great they look with any outfit. I have run into the most bizarre thing at the shows that I go to. I sell crochet items, mostly ‘nerd’ things (batman toques, Harry Potter scarves, things like that). When I just plain gave up engaging people, and just sat there, crocheting another item, making no eye contact, and not talking to anyone until they spoke to me first, my sales went up. Way up. Like, from 0 sales from an entire show, to entirely selling out my stock of scarves at one.